Kiko Fernandez-Reyes, Dave Clarke, Elias Castegren, and Huu-Phuc Vo have received the best paper award at COORDINATION 2018 conference for their paper "Forward to a Promising Future." Kiko Fernandez will be presenting the paper on June 19, in Madrid. The motivation reads: "Björn Victor is an engaged and didactic teacher who inspires colleagues and creates a common ground between students and teachers. With an extensive pedagogical experience and responsiveness, he develops courses with student-centered learning. As an educational leader, Björn works to constantly renew teaching and provide support and advice in everything from the development of new educational programs to educational training for colleagues." For a number of years, Mark Hill and Guri Sohi of the University of Wisconsin have maintained an informal “Hall of Fame” for the International Symposium on Computer Architecture , based on the (admittedly imperfect) metric of having co-authored 8 or more papers that have appeared in the premier venue for computer architecture research. In the computer architecture community it is considered a great achievement to be in this list. Professor Stefanos Kaxiras has just been “inducted.” Stanford, the University of Illinois, the University of Michigan, the University of Washington, and the University of Wisconsin each have 5 members. Microsoft Research has 4. The University of Texas has 3. HP Labs, UC Berkeley, UCSB, and the University of Colorado each have 2. CMU, MIT, and a dozen other institutions each have one. Now, Uppsala university is represented on the list. TACAS'18 distinguished artifact award winner at ETAPS i Thessaloniki, April 19, 2018. This artifact contains the code and benchmarks used to generate the results in the paper, as well as instructions on how to do so. An artifact is any additional material (software, data sets, machine-checkable proofs, etc.) that substantiates the claims made in the paper and ideally makes them fully replicable. 180113: The IEEE Micro Top Picks 2018 selection committee is delighted to inform you that your paper has been accepted to appear as a Top Pick this year. IEEE Micro will publish its annual “Top Picks from the Computer Architecture Conferences” issue in May/June 2018. This issue collects some of the most significant research papers in computer architecture based on novelty and potential for long-term impact. Any computer architecture paper (not a combination of papers) published in the top conferences of 2017 (including MICRO-50) is eligible. The Top Picks Selection Committee will recognize those significant and insightful papers that have the potential to influence the work of computer architects for years to come. This is a great distinction for UART, and the IT Department, as it is ---as far as we can tell--- a first for Sweden. The paper Trevor E. Carlson, Kim-Anh Tran, Alexandra Jimborean, Konstantinos Koukos, Magnus Själander and Stefanos Kaxiras. "Transcending Hardware Limits with Software Out-of-order Processing." IEEE Computer Architecture Letters (2017) was selected as one of three Best of CAL in 2017 by the Editorial Board of IEEE Computer Architecture Letters (CAL). Authors of Best of CAL papers get to present their work (and any follow-up results if they wish) at the IEEE International Symposium on High Performance Computer Architecture (HPCA). This year, the Best of CAL session will take place on the second day of the conference, February 27, 2018. This is a first for our department, to have a CAL paper awarded a presentation in the one of the top-two forums in Computer Architecture. Parosh Abdulla and Bengt Jonsson have, together with two French research colleagues, received the prestigious "CAV award" in 2017 . The award is in recognition of their research on verification of correctness for parallel programs and computer systems. The precise motivation reads "Parosh Aziz Abdulla, Alain Finkel, Bengt Jonsson, and Philippe Schnoebelen receive the 2017 CAV Award for the development of general mathematical structures leading to general decidability results for the verification of infinite state transition systems." The four recipients of the CAV award have since the 90-s developed increasingly powerful techniques for verification and bug-finding in parallel programs. Among their most important results are general analysis techniques that have had strong and lasting influence on the field, and shown to be applicable to an impressively large number of verification problems, including the automatic verification of multi-threaded programs and network protocols. Parosh Abdulla and Bengt Jonsson's research has in recent years been conducted under the hood of the UPMARC centre of excellence, where they have developed methods and tools for analyzing parallel programs that execute on multicore processors. The "CAV Award" is given once per year at the annual conference on Computer-Aided Verification, which is the most prominent international conference for research on computer aided verification. The purpose of the award is to recognize influential and prominent research in the area. Parosh Abdulla och Bengt Jonsson received the award dollar together with Alain Finkel and Philippe Schnoebelen, Paris, at this year's conference in Heidelberg. More information can be found at "CAV award" in 2017 and at http://i-cav.org/cav-award for previous years. Kim-Anh Tran has January 2017 been awarded an ACM-W scholarship. Kim-Anh Tran has January 2017 been awarded a professional activities grant from the ACM SIGPLAN Professional Activities Committee for attending the International Symposium on Code Generation and Optimization (CGO'17). Pontus Ekberg, has been awarded the Bjurzons Premium "for an excellent treatise in the field of science written by a student or young academic teacher." december 2016. Read about Bjurzons Premium here (in Swedish only). 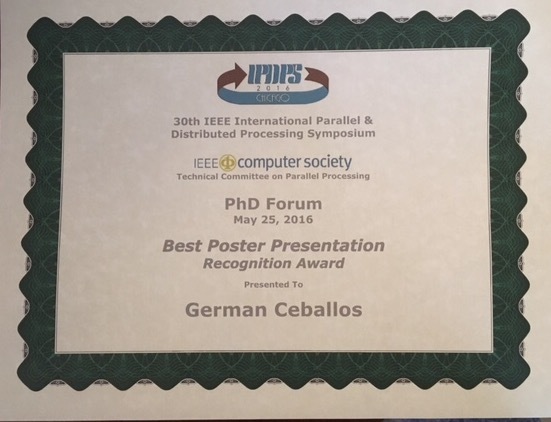 Best poster award at IPDPS 2016 (IEEE International Parallel and Distributed Processing Symposium) Germán Ceballos won best poster award for the PHD forum at IPDPS. Based on the work developed by the bachelor student Per Ekemark, we received the Best Paper Award in the conference Compiler Construction (Barcelona, 2016) . Multiversioned Decoupled Access-Execute: the Key to Energy-Efficient Compilation of General-Purpose Programs Konstantinos Koukos, Per Ekemark, Georgios Zacharopoulos, Vasileios Spiliopoulos, Stefanos Kaxiras, and Alexandra Jimborean. In Proc. 25th International Conference on Compiler Construction, pp 121-131, ACM Press, New York, 2016. David Black-Schaffer has been selected as a Wallenberg Academy Fellow! . Wallenberg Academy Fellows is a carreer programme that provides long-term funding for the most promising young researchers of all disciplines to develop their projects. 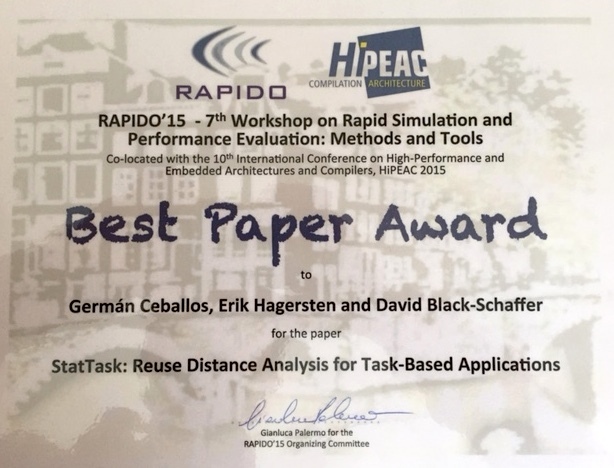 Best Paper Award at RTSS 2015: Pontus Ekberg and Wang Yi have received the best paper award with the paper: Uniprocessor Feasibility of Sporadic Tasks Remains coNP-complete Under Bounded Utilization at the conferencce The 36th IEEE Real-Time Systems Symposium , December 1-4 in San Antonio, Texas, USA. Best Paper Award at ECRTS 2015 Pontus Ekberg and Wang Yi for the paper: Uniprocessor Feasibility of Sporadic Tasks with Constrained Deadlines is Strongly coNP-complete. The 27th Euromicro Conference on Real-Time Systems; 7-10th July 2015; Lund, Sweden. PhD student Andreas Sembrant has won one of the Ångström Academy innovation awards for his work on memory system design. The award ceremony took place May 12, 2015. About Ångström Academy innovation awards. Dissertation Award: Nan Guan got the EDAA Outstanding Dissertation Award in 2014 in the category of New directions in embedded system design and embedded software. Nan recieved the award at the Opening Ceremony of DATE 2015 in Grenoble, 10 March. See press release. DATE is the largest European conference in embedded systems area with over one thousand participants every year. EDAA is the European Design and Automation Association , which is the main organization behind the DATE conference. Wang Yi have 2014 been appointed IEEE Fellow "For the contribution to safety-critical real-time systems". In total, 52 people in Sweden have been appointed Fellows during the 50 years the award has existed. 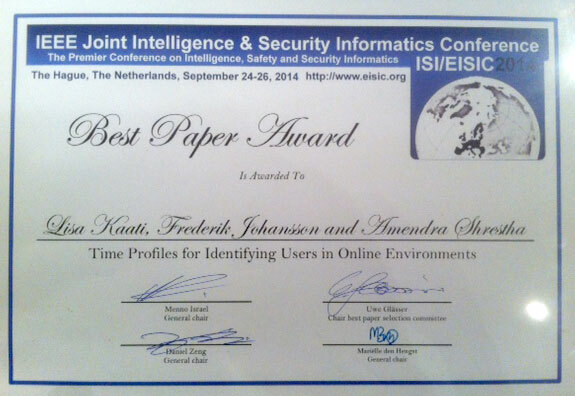 Amendra Shrestha and Lisa Kaati have together with co-writer Fredrik Johansson been awarded for the best publication at IEEE Joint Intelligence and Security Informatics Conference (JISIC) 2014 . For the paper "Time Profiles för Identifying Users in Online Environments " the conference was 24-26 September 2014 in Haag. The IJCAR 2014 best paper award has been given to "Approximations for Model Construction" by Aleksandar Zeljic, Christoph M. Wintersteiger, and Philipp Rummer. The paper presents a new way to integrate approximation techniques into automated reasoning procedures and proves its usefulness for the important case of floating-point arithmetic. 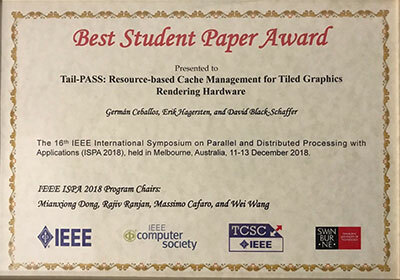 Alexandra Jimborean won the best presentation award at the 2014 International Symposium on Code Generation and Optimization for her paper Fix the code. Don´t tweak the hardware: A new compiler approach to Voltage-Frequency scaling with Alexandra Jimborean, Konstantinos Koukos, Vasileios Spiliopoulos, David Black-Schaffer, Stefanos Kaxiras. "The Björkén Prize" a reward for outstanding scientific research or other work based on science - either discoveries, inventions, or fruitful enhancements - that brings honor to Swedish research or contributes to the material improvement of the country. Philipp Rümmer share Oscar Award 2013 for Business economist and computer scientist with Linda Wedlin. Oscar prize is awarded each year young researchers at Uppsala University, who "through scientific writing is most deserved and represents the best hope for continued scientific authorship at the university." The prize consists of return of Oscar II's jubilee donation, this year of SEK 120 000 and can also be shared between two equally deserving. Doctor of Philosophy Philipp Rümmer, Department of Information Technology, received the prize for his research in computer science. He has quickly established itself as an independent researcher with international impact . Rümmer dealing with fundamental questions about the computer program correctness and his research has important implications for the development of efficient software for the computer components today are integrated in many different systems. See also: Press release in Swedish. Andreas Sembrant, Erik Hagersten, and David Black-Schaffer. "TLC: A tag-less cache for reducing dynamic first level cache energy." MICRO 2013). Wang Yi Received the CAV award 2013 for research on design and verification of time critical systems and for the development of the UPPAAL tool . The annual CAV Award has been established for a specific fundamental contribution or a series of outstanding contributions to the field of Computer Aided Verification. The paper "Deriving Probability Density Functions from Probabilistic Functional Programs" by Sooraj Bhat, Johannes Borgström, Andrew D Gordon and Claudio Russo received the EAPLS Best paper award at ETAPS'2013. The paper applies techniques from programming languages to machine learning problems in ecology, and is part of the rapidly growing field of probabilistic programming for machine learning. The paper "An Integrated Specification and Verification Technique for Highly Concurrent Data Structures" by Parosh Aziz Abdulla, Frederic Haziza, Lukas Holik, Bengt Jonsson, and Ahmed Rezine, received the EASST Best paper award at ETAPS'2013. This is the third time (which is also a record) that the algorithmic verification group has received a best paper award at ETAPS. The topic of the paper, verification of concurrent data structures, is a result of being exposed to new and relevant challenges in the areas of computer architecture and programming languages, e.g., through our work within UPMARC. The paper FIFO Cache Analysis for WCET Estimation: A Quantitative Approach, Nan Guan, Xinping Yang and Wang Yi - Uppsala University, SE and Mingsong Lv - Northeastern University, CN received the Best paper award at DATE 2013. DATE is one of the major conferences in embedded systems with over 900 submissions and 1000 participants each year. David Black-Schaffer has been awarded UTN's pedagogic award 2013 . He received the prize for his work integrating online and in-class education in the introduction to computer architecture course. Pontus Ekberg and Wang Yi. Bounding and Shaping the Demand of Mixed-Criticality Sporadic Tasks . In the proc of the 24rd Euromicro Conference on Real-Time Systems . 10-13 July, 2012, Pisa, Italy. 2012 AITO Dahl-Nygaard Junior Prize winner is Tobias Wrigstad, Uppsala University, for his work on ownership types, `like´ types, and Thorn. Read a few words about the price and Wrigstads work and the AITO Press Release 2012-03-01 . ETAPS 2010 . We received the EATCS (European Association for Theoretical Computer Science) award for best theoretical paper at ETAPS 2010. Title of paper: When Simulation Meets Antichains (on Checking Language Inclusion of NFA's) . Parosh Aziz Abdulla, Yu-Fang Chen , Lukas Holik , Richard Mayr , Tomas Vojnar . Updated 2019-02-21 10:43:39 by Roland Grönroos.